Scraper: First Strike is just one of a whole slew of VR games I've been working on over the past year. Last year, when I was just starting to get really busy working with VR development teams, I wrote an article here that offered a bunch of informative resources connected to the field of VR audio. The article I posted in 2017 took a general approach to the role that audio plays in Virtual Reality experiences. Since we're well into 2018, I thought we could benefit from expanding that topic to include the state-of-the-art in VR headset platforms. Taking a look at the hardware platforms that are currently available should give us video game composers a better idea of the direction that VR audio is currently headed. For one thing, VR is now broadly considered a part of a larger category that also includes AR (Augmented Reality) and MR (Mixed Reality) devices. Those two categories are often considered synonymous, although that's certainly debatable. Since there's no clear expert consensus at this point on what characteristics separate AR from MR, let's just consider them as one category that we'll call AR/MR for now. In this article I'll be focusing on resources that are specific to each of the competing platforms in VR and AR/MR. A wide variety of head-mounted devices now exist that can immerse us in imaginary worlds, or bring fantastic creatures to life in our living rooms. While many of these devices share common underlying technologies in regards to audio creation and implementation, there are differing tools and techniques that apply to each of them. I've included links in the discussion below that may be helpful in understanding how these technologies differ. The newly-released Magic Leap One is an AR/MR device. This means that it allows the wearer to see the real world, while superimposing digital images that seem to exist in reality, and not just within the device. For instance, an AR/MR device can make us think that a miniature toy dinosaur is toddling across our coffee table. 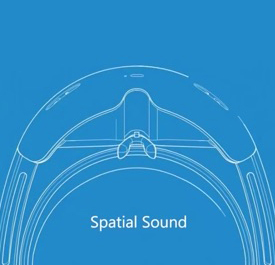 With this in mind, creating audio for AR/MR becomes a little tricky. For instance, let's say that we want our tiny dinosaur to emit a ferociously-adorable little roar as he climbs on top of our coffee table books. That sound won't be convincing if it doesn't seem to be happening inside our actual living room, with its unique acoustical properties. The real-life room has to be mapped, and acoustic calculations have to be factored in. This isn't an issue when developing sound for virtual reality, since the sound sources emit within an environment that exists completely within the virtual world. Now let's move on to discuss what's happening with the current VR devices. As we know, unlike an AR/MR headset, a VR device cuts us off completely from the outside world and plunges us into an environment existing entirely within the machine. There is currently a healthy and varied crop of VR devices from which to choose. The two most popular and famous VR headsets are the Oculus Rift and the HTC Vive. Both devices rely on positional audio technologies to deliver great aural experiences, and each company has worked diligently to improve the technology over time. In June 2018 the HTC Vive introduced a new Software Development Kit (SDK) for immersive audio. The new SDK allows for more sophisticated audio technologies like higher order ambisonics, higher resolution audio, more refined spatial acoustics (pictured right), and HRTFs based on refined real-world models to improve the accuracy of positional audio. 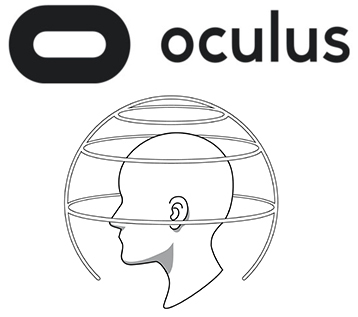 The Oculus Rift has upgraded their existing audio SDK to improve the positional accuracy of sounds emitting very close to the player (a technology they call Near-Field Head-Related-Transfer-Function (HRTF). They have also provided the option of implementing sound that originate from large sources (an ocean, for instance, or a forest fire). 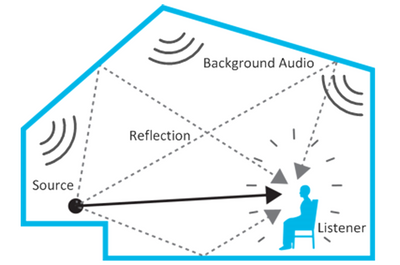 Using the Volumetric Sound Sources technology, large sound-emitting objects can project their aural content across an assigned radius consistent with their scale. The PlayStation VR, as the only console-specific VR device, does not share the same market with such devices as the Vive or the Rift and therefore is not faced with the same competitive pressures. Nevertheless, improvements continue to be made to the PSVR's technology. The newest model of the PSVR (released late last year) is a revised version with small but valuable improvements. Among the changes, Sony added built-in stereo headphones to the headset (pictured right), removing the need for players to hook up separate headphones in order to experience VR audio. Now let's take a quick look at the standalone VR devices (i.e. those devices that don't need to be hooked up to a computer or console, and don't need a mobile phone installed in order to work). These VR headsets offer untethered, cable-free virtual reality exploration, but they're also usually a bit less powerful and full-featured. The five best-known standalone headsets are the Oculus Go, the Oculus Quest, the Lenovo Mirage Solo, the HTC Vive Focus, and the Shadow VR. That's our discussion of where things currently stand with regards to VR platforms! In the next article, we'll be focusing on tips and tools for game audio folks working in VR. I hope you enjoyed the article, and please let me know your thoughts in the comments section below! 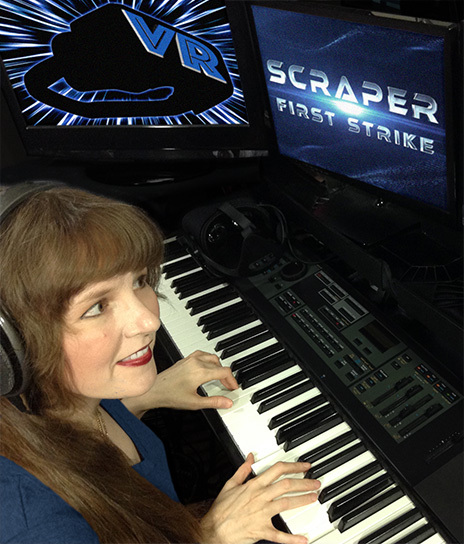 Winifred Phillips is an award-winning video game music composer whose projects include the triple-A first person shooter Homefront: The Revolution. She has composed music for games in five of the most famous and popular franchises in gaming: Assassin’s Creed, LittleBigPlanet, Total War, God of War, and The Sims. Her latest video game credits include numerous Virtual Reality games, including The Haunted Graveyard, Audioshield, Scraper: First Strike, Bebylon: Battle Royale, Fail Factory, Dragon Front, and many more. She is the author of the award-winning bestseller A COMPOSER'S GUIDE TO GAME MUSIC, published by the MIT Press. As a VR game music expert, she writes frequently on the future of music in virtual reality games.